Plants perennial, colonial. Stems erect, simple or branched distally, 30-90 cm. Leaves: petiole often absent or winged, 0.1-1.5 cm; blade strongly 3(-5)-veined, elliptic to oblanceolate or ovate, 3-11(-15) × 1.5-4.5 cm. Cymes dense to open. Pedicels 1-5 mm. Flowers sometimes double; calyx green or reddish, often cleft, 15-25 mm, glabrous or rarely with scattered trichomes; petals pink to white, often drying to dull purple, blade 8-15 mm. Capsules ca. 15-20 mm. Seeds 1.6-2 mm wide. 2n = 28. Flowering spring-fall. Waste places, streamsides, fields, roadsides; 0-2600 m; introduced; Alta., B.C., Man., N.B., Nfld. and Labr. (Nfld. ), N.S., Ont., P.E.I., Que., Sask. ; Ala., Ariz., Ark., Calif., Colo., Conn., Del., D.C., Fla., Ga., Idaho, Ill., Ind., Iowa, Kans., Ky., La., Maine, Md., Mass., Mich., Minn., Miss., Mo., Mont., Nebr., Nev., N.H., N.J., N.Mex., N.Y., N.C., N.Dak., Ohio, Okla., Oreg., Pa., R.I., S.C., S.Dak., Tenn., Tex., Utah, Vt., Va., Wash., W.Va., Wis., Wyo. ; Eurasia; introduced in Mexico, South America, Asia (India), Africa (Egypt), Australia. Saponaria officinalis, long cultivated for its showy flowers, is a widely naturalized, sometimes troublesome weed. It may persist for years about abandoned home sites. 'Double'-flowered horticultural forms, which may lack functional stamens, also occur in the wild, where locally they may be as common as, or even more common than, 'single'-flowered forms. 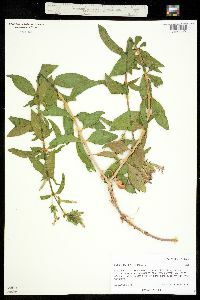 In former times, the leaves of this species were gathered and either soaked or boiled in water, the resulting liquid being used for washing as a liquid soap. Because of its saponin content, the species can be poisonous upon ingestion, in much the same manner as Agrostemma githago. Perennial herb with rhizomes, colonial 30 cm - 1 m tall Stem: upright, unbranched or branched above, mostly hairless. Leaves: opposite, fused at the base, 3 - 11 cm long, 1.5 - 4.5 cm wide, elliptic to reverse lance-shaped with a pointed tip, strongly three-veined. Flowers: in dense to loose clusters (cymes), often paired, on upright, 1 - 5 mm long stalks, pink to white, subtended by paired bracts, fragrant. Stamens ten. Styles two. Sepals: fused at the base into a tube (calyx). Calyx tube green or reddish, 1.5 - 2.5 cm long, cylindrical, 20-veined, membranous, with short lobes, often becoming deeply two-lobed. Lobes shorter than tube, scarious (dry, thin, and membranous), with white margins and a pointed tip. Petals: five, pink to white, 8 - 15 mm long, oblong to reverse egg-shaped, distinctly clawed. Fruit: a dehiscent capsule (opening by four teeth), 1.5 - 2 cm long. Seeds numerous, dark brown, around 2 mm wide, kidney-shaped, laterally compressed. Habitat and ecology: Introduced from Eurasia. Very common as a weed in cindery and sandy soil, and extremely common on railroad ballast. In non-sandy areas this plant is somewhat less of a weed. May also be found in fields, open woods, and along roads. Etymology: Saponaria means soapy, referring to a time when the leaves of this species were either soaked or boiled in water to create a liquid that was used for washing. However, this species can be poisonous if ingested. Officinalis means "sold in shops; official." This may apply to medicinal, edible, and otherwise useful plants. This species prefers a very sandy soil in which it migrates rapidly. Found throughout the state along roadsides, railroads, and spillbanks of dredged ditches and in waste places and fallow fields. This perennial should be regarded as an obnoxious weed in the parts of the state where there is a sandy soil. Colonial by rhizomes, erect, 4-8 dm, mostly glabrous; lvs 7-10 נ2-4 cm, elliptic to elliptic-ovate or lance-elliptic, acute; infl congested and subcapitate to open and oblong- pyramidal, to 15 cm, the primary bracts leafy, the ultimate ones scarious; fls fragrant, often double; cal 1.5-2.5 cm, the lobes triangular-attenuate, the tube often becoming deeply bilobed; pet white or pinkish, the auricles none, the appendages conspicuous, the blade 8-15 mm, oblong to oblong-obovate; stamens exsert; 2n=28. Native of the Old World; formerly cult. and now established as a weed of roadsides and waste places or along railways throughout most of temperate N. Amer. Summer.